One of the nice things about living in the Cape Region is the AM radio reception. Thanks to the bend in New Jersey’s coastline, it’s relatively easy to tune in the big New York City AM radio stations, such as WABC (770), WCBS (880), and especially WFAN (660). For many years, listening to Mike Francesca and Chris Russo (Mike and the Mad Dog) has been a great way to while away a long afternoon’s commute of 40 minutes or so, as they natter on about sports. When it came to golf, however, their chatter is usually not so intriguing, except for when they have Ann Liguori on air to join them, talking about a major event such as the U.S. Open. This woman clearly knows her stuff about the game. If you haven’t heard her during these radio segments, you’ll come to the same conclusion if you read her collection of celebrity golf interviews, A Passion for Golf, (Taylor Trade; $22.95 SRP). Liguori is a pretty intense sportswoman in her own right, and a worthy candidate for her own interview. A self-confessed sports nut, she played a wide variety of games throughout her youth, earned sixteen letters in high school, and went to summer sports camps at then-Towson State College in Baltimore County, Maryland. Golf wasn’t in her life at that point, until she embarked on a largely self-directed career in sports journalism. Liguori bounced around a bit, and eventually became involved two major sports programming ventures. The first, with WFAN, is now in its twentieth year. The second, with The Golf Channel, eventually became the basis of this book. Over several years, Liguori booked a wide selection of golf-loving celebrities for interviews during and after a scheduled round. For each chapter, Liguori adds to each transcript with notes about how the interview was set up, along with a short but informative biography of each subject. The book first came out in 1997. This year’s edition includes several transcripts from interviews conducted since that time, as well as updated commentary about the first set of selections. For example, NBA basketball great Charles Barkley’s golf swing is nothing to copy by any means. Nonetheless, the man is not only a great tease, he’s also brutally frank about a wide range of topics. It’s a refreshing interview, not least of which because Barkley seems bound and determined to avoid lapsing into any of the usual sports clichés. Liguori: “Why are you so passionate about golf? Another interview subject has a connection to the Cape Region. Samuel L. Jackson is not only well known for such movies as “Pulp Fiction,” but also locally for his role in The Red Violin, one of the most popular films ever shown at the Rehoboth Independent Film Festival. He’s also mad about golf, as his interview delightfully displays. In addition to folks from the sports and movie worlds, Liguori snagged some great chats with golfing musicians such as Alice Cooper. She also talked to major contributors to golf’s growth in recent decades, such as IMG’s Mark McCormack and Ely Callaway, the golf club maker. 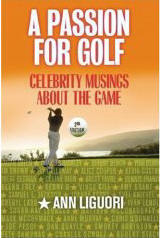 A Passion for Golf is a very entertaining read, and well worth considering as a Christmas gift for a golfer you know.